Even before coming out of my dark ages, I remember seeing some of the winter village sets and thinking how awesome I thought they were and how fun it would be to make a winter town out of them to display during the holidays. After seeing some displays this winter, something snapped in my brain and I've been obsessed with creating my winter masterpiece. I am wrestling with the best way to go about collecting the older released sets as well as how to introduce my own buildings. It really comes down to one main thing for me: COST! I've added the following to my Wanted List on BL: #10222 Winter Post Office, #10216 Winter Village Bakery, #10229 Winter Village Cottage, #10235 Winter Village Market, #10245 Santa's Workshop, and #10249 Winter Toy Shop (2015 edition). First, aside from the train and the original Winter Toy Shop, are there any other Winter Village Sets I'm missing? The train will most likely make its way onto the list as well. I figured I would try to leverage the collective brain power of the Brickset community to help me either fix whatever snapped in my brain, help me develop a strategy on collecting, as well as offer additional insights/photos/ideas/etc... on how I could make this a really special and memorable display. I really see four possible ways to approach the procurement of the necessary bits: 1) Buy the completed sets (new or used doesn't really matter to me). 2) Bricklink the sets (considering cost is my biggest limitation, this is likely not the best route for everything). 3) Use resources like the PAB wall/site and local "bulk brick" stores. 4) A combination of all of the above. There is a local Bricks and Minifigs store that has a great selection of bulk Lego that I've recently been picking through to complete some other projects. Unfortunately, on my last trip I had intended to go in and buy as many of the tan/dark tan/every variation of brown I could only to walk in and see a couple literally dumping those color selection bins into a massive bag. I had to talk myself off the ledge... I see this as potentially the best route for a vast majority of the pieces. They are constantly getting in new stock that is, for the most part, that is clean and in good shape. There are a decent amount of pieces that would likely never show up, and so I'd have to BL those. Of the six sets listed above, the BL price for used sets minus shipping would be $713. The Bricks and Minifigs store mentioned above sells bulk bricks in a variety of bags up to $60 I believe. I'm just seriously wondering if I could spend ~$150 and get all of the "common" bricks, BL the rest for another ~$100 (no idea how accurate that is), and save $500 compared to buying complete sets. There would be additional charges if I wanted to make it a complete, living village connected by roads, trees, additional buildings, etc..., but that could come down the line. Well, out of fear of losing the majority of readers, I'll make myself stop. I'd appreciate any feedback that could be given. Just knowing myself, when I've been bitten by similar bugs in the past, my tendency is to go WAY overboard and want everything immediately. I can see part of the fun of this type of project is amassing parts over time. So I have to remind myself to be realistic and enjoy the ride. I think more often than naught people forget two things when bricklinking a set: Shipping costs, and more importantly time. How much is your time worth to you? Buying a used set may cost more, but by how much? Is it worth that to go bl all of these sets? At least you can get Santa's Workshop, Toy shop and holiday train for a somewhat inexpensive cost. The others you have to weigh the pros and cons, and only you can do this. I'd buy the sets...if I was going to do this...but this is just me, I wouldn't spend a second of my time BL-ing....zero joy in that. If you enjoy BL-ing and can save any money at all, then go that route. Buying bulk lots of bricks is pointless for what you're wanting to do, because you'll get so little of the elements you need in there. You really have two choices: BL them, or buy them new/used. I suspect the used prices are low enough to render BLing them almost pointless, as you'll probably not save all that much, and it'll take quite a bit of your time. I am going to come out of left field with a different idea, which you may hate, but may cost way less. Friends has a winter sub-theme coming out. If you bought all those sets and the winter toy shop it is $225. If you spent extra on just pieces and an extra Friends chalet ($40) , you might be able to create a very interesting and unique winter ski village. I have all the winter sets sets beyond the first train. I have made my own bunny ski hill and skate pond, and am thinking of buying into the Friends sub theme, maybe changing some of the colors out to a more muted color, and creating a small ski village scene. This method might give you a quick way to get into a winter scene, and yet have a fair amount of fun trying to modify these base sets into something you want. In my case, $145 buys me into the entire Friends sub-theme. Also, do we know if they plan to do a winter set this year, and what that will be?? Perhaps and other redo set, or else something new. Just the toy shop, train, and if they do a new set that would give you a fair amount to get started. You could add a $40 Friends chalet and modify that fairly easily to add an extra building or two into the scene. Another option.. I have my Christmas sets, but in January I put out winter sets. This includes Lego Creator Mountain hut. I basically added snow to the house and ground to make it look like a nice cabin in the winter. Lakeside Lodge is small, but I actually just ordered it due to this thread because it is a nice price on Amazon right now. I will add some snow to it and it should add in nicely with my modified Mountain hut. Point. 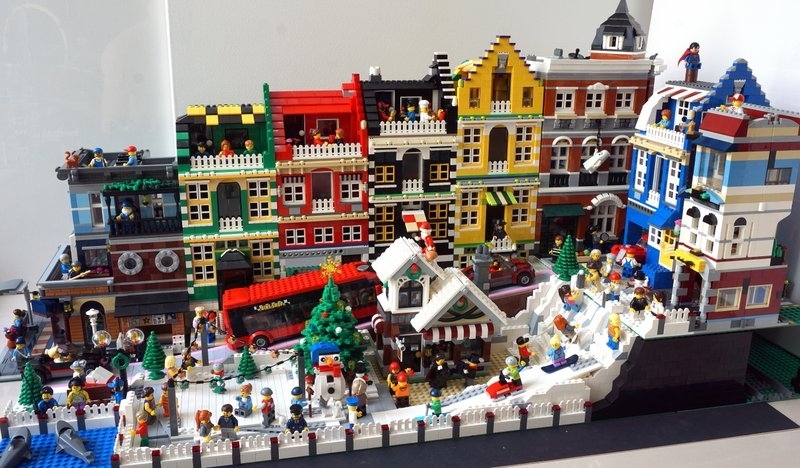 There are lots of ways and choices to make a very cool winter scene display, and it does not have to involve trying to buy or bricklink all the old sets. You might just need to look at some of the sets out their differently. 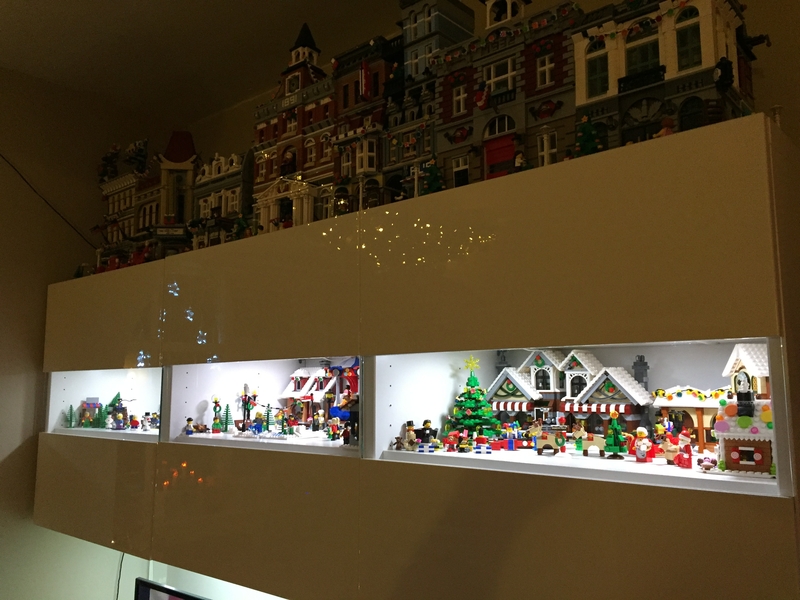 As @ColoradoBricks pointed out, those companion sets go really with with the rest of the winter village theme. Those were the free gifts I believe for Oct and Brick Friday in their respective years. 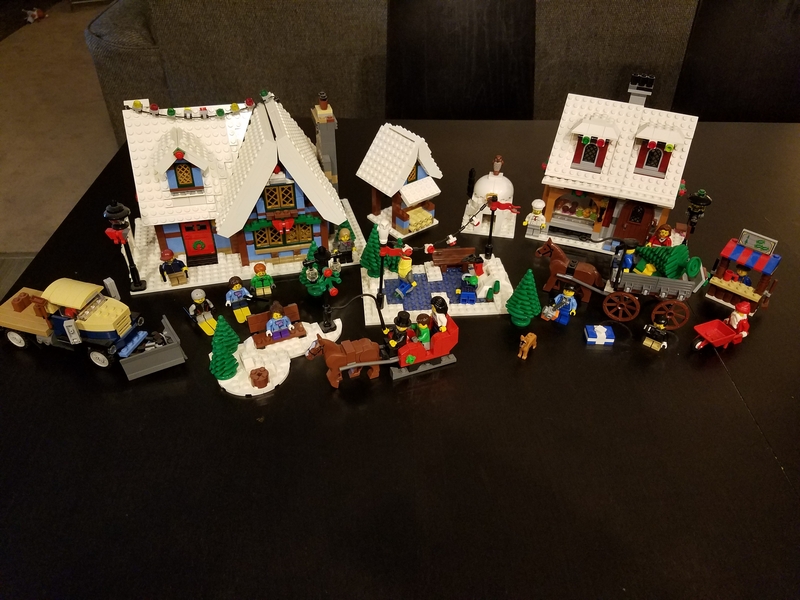 I got into collecting the Winter Village sets in 2013 when I picked up the cottage and the market. 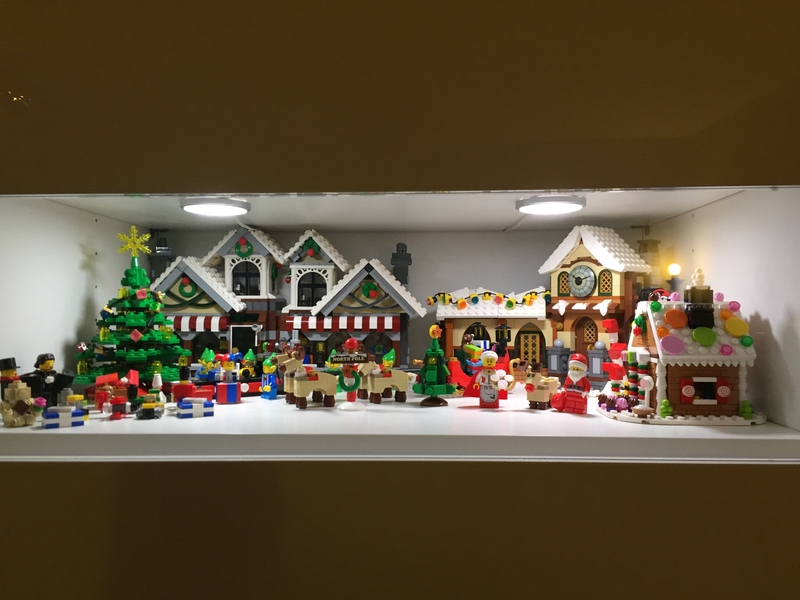 The following year I got the retired sets, post office, bakery and toy shop off of ebay and the holiday train #10173 off of bricklink. The sets on ebay set me back about $120 each and the train was $300 and it was missing the minifigs, though I've slowly started trying to get them. So trying to get the retired sets might be a little expensive. It's possible you might still be able to find Santa's Work Shop still in a LEGO Store, I saw a few around Christmas time this year. Like @tamamahm I've started looking at other sets that might fit into the winter theme, Like the new friends sets. I've also started collecting some of the older house sets to fit into my display. To clarify to my original post, the Bricks and Minifigs store has several tables full of bulk bricks. One can shop them just like a PAB wall in that you get to take what you want and leave the rest. Their largest bag option fits, in my estimate, roughly 2500-3000 pieces. At about $.02/piece, that seems like a decent price. In my last trip I pretty much picked all of the non-train pieces for #7722 and it only cost me $8. As an example, there are 133 unique Black part types among the 6 sets in the original post. There is a very real chance, based on my last two trips, that 65-75% of those pieces could be acquired through their tables. Looking at the other colored pieces, there is probably a strong likelihood of 75% of the pieces coming together off their bulk tables alone. I realize shipping and cost, even on 25% of the remaining pieces, from BL would be fairly steep. @tamamahm, thank you for your creative suggestions! I'll have to start looking through that sub theme and get put my creative hat on. I think that would make a great addition to the village! Do you have set numbers for any of the Friends sets you mentioned? Or for the subtheme? @catwrangler, as I'm still just getting back into Lego, I need to learn to think outside the box. Although I do love the tan/brown color palette, I would seriously consider swapping out those pieces for different color combinations. There would certainly be a uniqueness to the village compared [email protected] t of the box" sets. The Friends one are not out until August. I am hoping by then we will also know what the plan is for any winter set this year. This article shows and I think has the set numbers. If you go to the front page of brickset, you should also be able to just pull up the Friends sets from this year and easily see them. Here is the small lakeside cabin. It is small, but think with some added snow, it will make a nice little wood cabin in a scene, especially with the moose. Also... I do keep my eye out for animals. For example, I bought one of the Disney sets just to get the three bears from Brave. Friends sets often have white rabbits. I have accumulated some dogs and polar bear. The Lego minifig collectibles are always worthwhile to check out for figures that go well into the scene. Winter village sets are particularly special to me as they brought me out of the dark ages. At first, I was intent on buying older sets although this was beyond my Lego budget. I've accepted now that I won't be able to have all of the winter village collection back dated. So I began to focus on creating my own Christmas builds using multiple copies of newest sets. I bought 3 santa's workshops to create a larger version. My one word of advice on buying (as I was caught out myself): don't assume that buying Christmas related Lego is cheaper to buy out of season. i bought lots of my Christmas sets last summer, assuming that I was saving money as the prices would inflate closer to Christmas. I was wrong. I reasoned that winter prices would be higher as more people would be thinking of buying such sets. What actually happened was that prices were cheapest in November, when people were in their lofts. I guess it's all about supply and demand. You've only got to look at the winter train, which is currently bobbing around £110. Lego will inevitably make it available again in November for £70. going the friends route will be a good option for sourcing great pieces. You could always sell the friends dolls if they don't fit your theme. And the rest of the holiday vignettes from 2015. Just looked at the prices of the Gingerbread house and yikes.... Granted, it is one of the most visually appealing sets Lego has done, IMO. Also great additions @grounded, thanks! I love that Gingerbread house! You might also want to consider the Creator set #31038 Changing Seasons. We incorporated the winter build into our village this year, and it fit in well. We really enjoyed the fireplace that lit up and the snow blower. Yes, this is another one I have for the winter scene. I only did not mention it because it is retired. If going for retired.. I think I slightly preferred the look of the Mountain hut, which I think might mesh well with the lakeside lodge which is out. Any of them are fairly nice to consider. It really just depends on the sort of scene you are looking to create. If you want to go "all out" you will also need to build these. I started sharing with my wife what I wanted to do in terms of this village (maybe I should have started with that???). Her first response, "Where do you think you'll put this?" I see no reason our dining room table can't support the entirety of the village?! I'll likely need to give this particular area some thought prior to going all out on add-ons as it will significantly impact the design. Her first response, "Where do you think you'll put this?" First of all, That's what she said. Second, now that that is out of my system, this sounds like the typical response of someone who is trying to limit a dreamer such as yourself. Last, and most serious--can't you just invest in a lot of white slopes and build those onto literally the roof of any building? @BillyBricks84, I had the same thought with the white slopes. I like the iconic sets that Lego has put out, but there is nothing stopping me making my own structures for less. You can get 16x16 white plates from Bricks and Pieces for $1.88. Not too shabby. You don't have to get all the Winter sets in order to create your own Winter masterpiece. 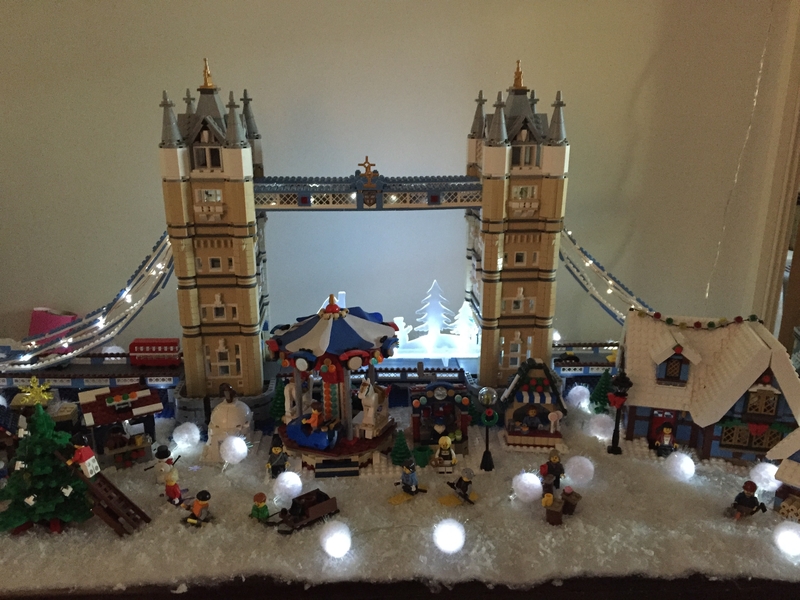 I did below MOC last year with only 1 Winter set in it (I do have all the Winter sets but only opened 1 so far). The rest of the buildings are alternate models of official modulars and MOC builds. You can just make do with what you have for the buildings, though obviously will need lots of white bricks and plates for the snow base. @Recce, that scene is awesome! A big reason I wanted to start this thread was to help get my brain out of the "box" of what a winter scene had to be. I certainly love the look of all of the official winter sets, but I'm quickly realizing with everyone's suggestions that there are a lot of ways of going about it. I just saw a Toy Shop pop up on a local selling site for a reasonable price. Maybe I'll start there and then expand around it. Yes, the fun part is considering alternative choices. One of my fav additions to my Halloween scene was Chima 70133 and then some extra webs from one of the racers. Well, I picked up a bin of bulk bricks last Friday for $25. There were several sets that I could see from the pictures that more than justified the price. Lucky for me, as I was sorting through the other bits, I stumbled across the small wood shop from #10229. It's only missing one of the 8x8 white plates. It's a small first step, but somehow a very meaningful one. Plus it gave me something to show my wife in person so she could get a feel for some of the sets styling. She's a fan! There are several other bits in the bin that I wonder if they're also from one of the winter sets or vignettes. I know there's a decent amount from the 2012 advent calendar. I reached back out to the lady I bought from and told her that if she had any other sets and wanted to sell, that I would love to buy them from her. I mentioned the few winter parts I found in the box and asked specifically if she had any of the winter village sets. Turns out the bits I got weren't meant to be in the bin...oops! 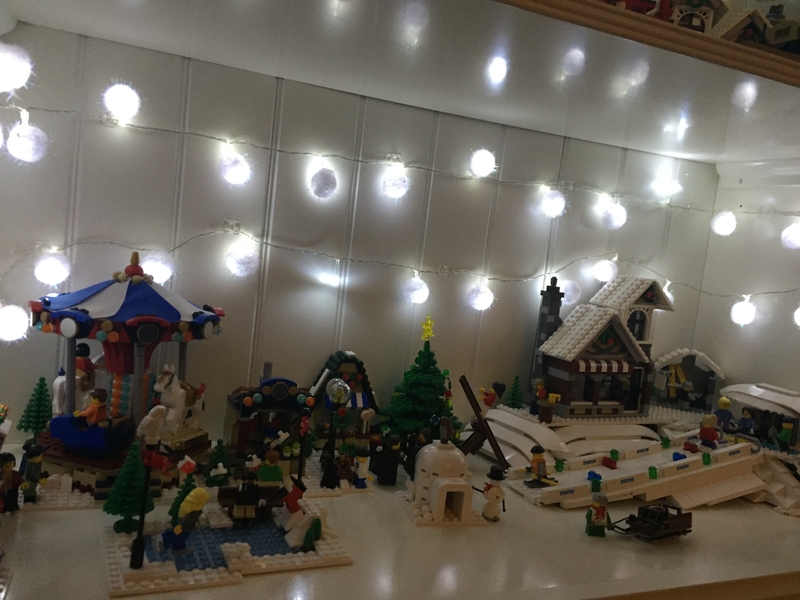 However, she apparently has all of the winter village sets and is wanting to sell them. Based on what she let these others go for, I have my fingers crossed that I can knock out a huge portion (if not all) of the sets for a VERY reasonable price. I've pretty much maxed my Lego budget with the Mrs. as of late along with several other larger household purchases. Not sure she'll go for it. But $150 for both!? The cottage alone is worth more than that. I'll have to be strategic about how I approach this one. Maybe the seller would consider a payment plan? EDIT - Looks like it also includes #3300014. So a conservative used BL value for all three would be $310? That's a really good deal. The cottage was $99 And the bakery was $54.99 so you're getting them below rrp, not to mention including the sleigh ride set too. The way I always think about this is that it's already in my mind to purchase these things and this is an especially good deal. So, instead of paying a lot more later, I can get them now for less. And honey, you've been on your feet all day, so wouldn't a foot rub be nice right about now? Well, Mrs. Switch didn't say "No" at least. So there's that. I told her what sets they were, showed her some pictures, told her the typical price for used complete sets, and her response, "Huh, that's a good deal." In my word that's basically a green light! @mustang69, your logic of it being below RRP was a good selling tactic too. Plus additional appreciation on the sets (assuming no remakes like the toy shop). I let her know that I could always recoup the $150 pretty easily. The main thing I'm wrestling with is several other large expenses we're dealing with at the moment. It's difficult to justify the money, even for Lego. Looks like I'll have to sell some Lego to buy some Lego. So off to post some sets I guess! I'm a little ahead of schedule now I guess! The only things missing are one minifig from the Cottage set, one hair piece from the boy in the sleigh, and the small brown sled for the Cottage set. There are a few other minor things like the lights over the ice pond not being the correct trans studs and half the roof of the workshop in the center back not being a full 8x8 plate, but for $150, I'll take it! Now to dust and do a detailed inventory! Sweet!! Congrats! My holiday themed sets are some of my favorites! It is a toss-up between Christmas and Halloween as to which I prefer. Congrats @Switchfoot55, like Tamamahm the Winter Village theme is my favorite, I just hope TLG can come up with some good sets in the future. The last two offering were a little on the disappointing side. I'm glad you were able to get some of these sets to make a start; I think you'll find having it in situ helps with inspiration on where to go next with the layout, too! So for those of who you are continuing to follow my random thoughts here (thank you by the way), in looking at some of the other winter sets, I'm left wondering if BLing the pieces or finding them at my local stores would be far most cost effective than purchasing? For instance, #10222 is selling for a low of $190 right now. I can BL the pieces for $140 (minus shipping of course). I'm extremely confident I could find the majority of the pieces at Bricks and Minifigs for far less than that. It just seems as if there aren't a lot of "rare" pieces in the winter sets, with a few exceptions mixed in. I guess it honestly makes me question my recent purchase of the three sets a little bit. I have NO BLing experience, so it's very likely I'm missing something that is obvious to most others. Another example would be #3300014. At 93 pieces, you're telling me I couldn't get them for less than $30? I'm spiraling a bit, but just some thoughts that were on my mind. 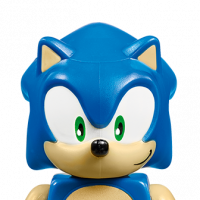 ^I guess the question you have to ask yourself is whether you actually want to have the exact sets that were produced or if you just want to create a cool (punny, right?) winter village. If you are just aiming to make a winter scene, go ahead and BL parts so you can emulate the sets but with your own twists or while avoiding expensive exclusive/rare pieces. I don't think you should regret your recent purchase, especially since you were able to get a great deal on it. I am not an exact parts needed person, or a completist. I say pause. Look at what you have. Look what is coming down the pipe this year and determine the direction you want your scene to take. Do you want a full village? More scenery? Two small different scenes? What are the minimal pieces you would want to complete a scene? I think there are many ways you could go with this. The nice part is that it does not need to be solved at once, or even several months from now. I yet again appreciate the perspective and feedback from everyone. In my mind it all has to be done now. I don't know why I continually do that to myself. I think this really needs to be a labor of love and come together over time. I have some concepts in mind that I just need to actually sit down and plan out. That would certainly help determine my next steps. Just missed #10254 Winter Holiday Train on a local selling site for $30. Snagged a used, but complete #10245 Santa's Workshop this past weekend for a killer price. And rumors have it that #10249 Toy Shop may find its way into my possession come Father's Day. I have to admit that when I first posted this less than two months ago, I didn't anticipate having three full sets already with a fourth right around the corner. Not only that, but getting them for the price that I did. I'm excited to start doing some initial layouts and filling in my scene with additional items! Perhaps the most exciting part for me is how supportive my wife has been in my desire to put together a village. It has made the whole process that much more enjoyable. ^I love the sets in those cabinets! I figured I would do a similar "fake snow ground" under stuff to tie it together until I could build a full brick-built scene. What are those longer curved pieces slightly behind the bunny hill? My son and I recently went to a model train show and saw a pretty huge winter display. Several of their buildings were the "official" sets presumably doubled or tripled along with some other MOCs to fill it out. I'll upload pictures soon, but the road they build through it is definitely the direction I'd like to take things. The curved pieces are actually from the roof of sydney opera house. My wife took it apart so she could use those pieces to give the snow effect. I've determined this thread is really more a journal of my developments. Hopefully it'll be fun to look back on and see the progress that was made as I'm sipping Hot Coco next to my Winter Village. As suspected, I did receive the #10249 Toy Shop for Father's Day! I still certainly have my sights on the other official sets both past/future. But I have a solid base to build my Village from. Now I can start designing a few additional pieces to fill in the gaps between buildings! Wonder what it'll be this year. I will be interested as well to see what they do this year, but almost prefer a remake because I have too many large sets I already want to buy, plus with the Friends sets coming out I already have a few sets I want for our scene.